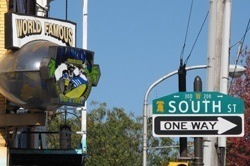 One of the most vibrant, eclectic, historic and fascinating neighborhoods in the city is bounded by South Street to the north, the sports stadiums to the south, Broad Street to the west and the Delaware River to the east. This is where the Italian and Irish immigrants arrived in the 19th Century, the site of the oldest church in Philadelphia, Old Swedes', and where Rocky ran. You’ll see vibrant market stalls, traditional Italian grocery stores, spice shops, bakeries and great restaurants and cafes. There are massive murals, up and coming shopping areas, and a fascinating sightseeing spot at the Magic Gardens, the work of Isaiah Zagar, which includes a fully mosaiced indoor gallery and a massive outdoor labyrinthine mosaic sculpture. Eat a Philly Cheese Steak and other local food, and wander among the locals from all corners of the world.